‘Sago on Tuesdays’ is an odd name for a bookbindery in a small village on the Golden Plains of country Victoria. When my Gran convinced me to change my path in life and go back to a family trade, I needed a name that expressed our love of the simple, practical, country life we have chosen in Napoleons. This is the one she chose – it is an odd name, but it has history. In my grandmother’s house, Sunday night was always a fantastic roast; Monday was naturally shepherd’s pie made from left-overs. Sago was a handy filler for the end of the wage week, cooked together with gravies, or as a dessert. It was about making do until the next week’s meat and veg were delivered on Wednesday. A slower, seasonal life, where making do, growing and making by hand, and repairing are honest pursuits. So, here’s to keeping it simple.. Roast on Sundays, pie on Mondays, and Sago on Tuesdays. A bookbinder, in an old schoolhouse. 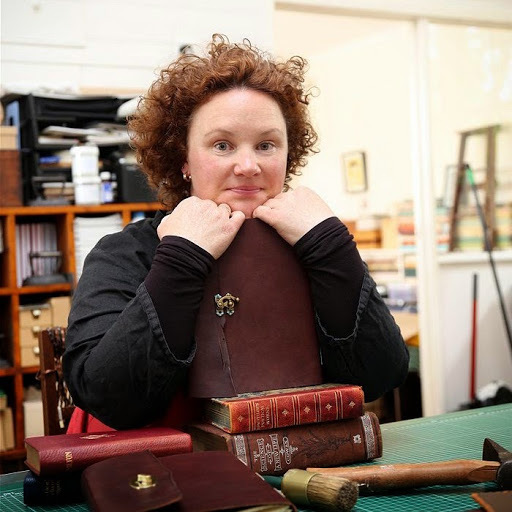 My name is Sonya, and I am a bookbinder. I came to my rare trade later in life, after careers in mathematics and language, to fulfill a promise to slow down and create, and to pursue a traditional family skill. That’s me in the photo. The techniques I use are honest, tactile, and cannot be rushed. That has forced me to slow and appreciate the beautiful tools, materials, mechanics, skills and ideas that flow in the quiet spaces of time. We bought an old schoolhouse at auction. Though it was significant to it’s rural community, a lovely example of timber frame federation public buildings, and in terrific structural shape, it wasn’t heritage protected. We could have bought land anywhere, but this was a chance to save and restore a piece of history, to settle into and contribute to a village environment, and be able to work from home with a garden and orchard to keep us grounded and honest.